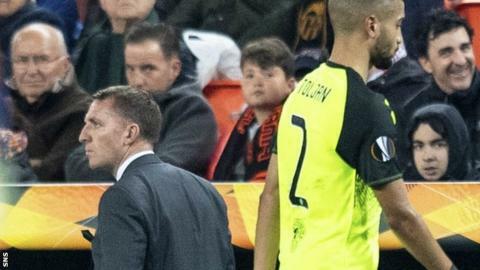 Jeremy Toljan's sending-off "took the game away" from Celtic, said Brendan Rodgers after his side's European season ended with defeat in Valencia. The full-back was booked twice in 11 first-half minutes, meaning Celtic had to play almost an hour of their Europa League last-32 second leg with 10 men. Kevin Gamiero's goal earned Valencia a 1-0 win and a 3-0 aggregate victory over the Scottish champions. "I thought the referee took the game away from us," said manager Rodgers. "I thought it was a free-kick to us because the player came in on the blind side and sort of had contact with Jeremy, which knocked him over. That then changes the dynamic of the game. "I spoke to the referee after the game. He said it was a definite sending-off. I thought it was really harsh." Having been disappointing in defeat in Glasgow last week, Celtic were far more accomplished at the Mestalla. Rodgers altered the shape of his side to a 3-4-3 formation and they used the ball far better, creating chances for Jonny Hayes and Kristoffer Ajer with the game still goalless. "Our shape worked really well for us," said Rodgers. "We showed a lot of confidence and carried a threat in our penetration. We looked like we were going to get that goal that we craved. "The bravery of the players was absolutely incredible. I'm very proud of them but if you make mistakes at this level, defensively you'll get punished. Unfortunately for us, that's cost us."